In a bowl mix together chopped apple, lucuma, mesquite, coconut palm sugar and cinnamon (or for version 2 it will be agave, cinnamon and apple and then sprinkle corn starch over top and mix). Heat tortilla in the microwave to soften, this is key or your tortilla will tear. 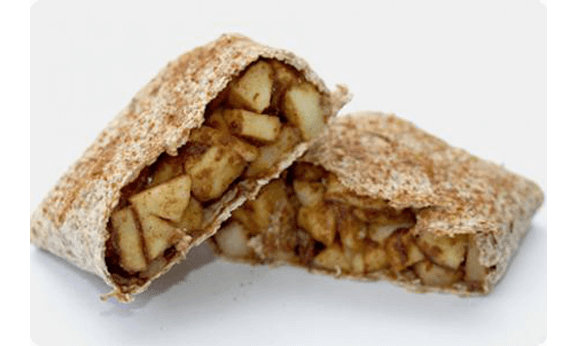 Place apple mixture in the middle of tortilla and fold like a burritos folding in the ends and then wrapping the sides. Place on a non stick baking sheet or foil lined baking sheet sprayed with coconut oil seam side down. Make a couple of slits in the top of the tortilla. Mix the coconut palm sugar and cinnamon together for the topping, this will be way more than enough I just have this mixture sitting around as my cinnamon sugar. Lightly brush the top of the tortilla with melted coconut oil and sprinkle with the cinnamon sugar mixture. Place strudel in the oven and bake 12 - 15 minutes. Slightly longer if you want really soft apples, I like mine with some bite, just watch that the tortilla don’t get too brown.